Beautiful Beauty for Ashes Boutique Jewelry presents this is exclusive SPECTACULAR RAINBOW ICE CZ Pendant! Super Sparkly, and turns different colors (or appears to) as you move, depending on the lighting. 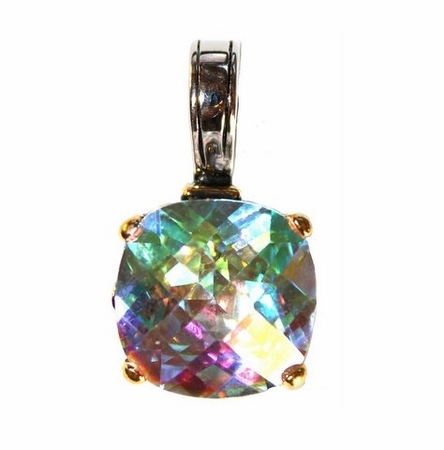 The center stone size is a whopping 16mm x 16mm, and has a cushion-cut or checker cut (as some call it) aurora borealis CZ. An official BFA stamp is embedded on the inside of the bale. All photos were taken of the same pendant at different angles to show how quickly the colors change with movement. The bale and surround is solid brass with a thick coat of white gold rhodium plating and yellow gold plated accents in an old world intricate design! The bale opens to fit on any large or small chain or belt. The back portion of the pendant features a cute heart cut out design as shown in the photos. Makes an excellent gift, great for all occasions! Matching ring, earrings and bracelet with extenders are currently for sale in our store! Our double strand Throne Room chain shown in photo goes perfectly with all our pendants, sold separately in our store.